In the year 2000 the Royal Australian mint released a commemorative 50 cent coin into circulation celebrating the the dawn of the new millennium. This coin had the standard Ian Rank-Broadley portrait of Queen Elizabeth II on the obverse, and the reverse had a new design by Vladimir Gottwald. Seen above the reverse comprises a stylized Australian flag with the large legend “Millennium Year” and “50 Cents”. For those who don’t know, the Australian flag consists of the Union Jack in the top left, the 7 pointed federation star below, and the constellation ‘The Southern Cross’ to the right. With a mintage of nearly 17 million the Millennium 50 cent is hardly a scarce coin. The crosses of the Union Jack are incuse on the Incuse Millennium rather than in relief (raised) in the standard Millennium 50 cent. 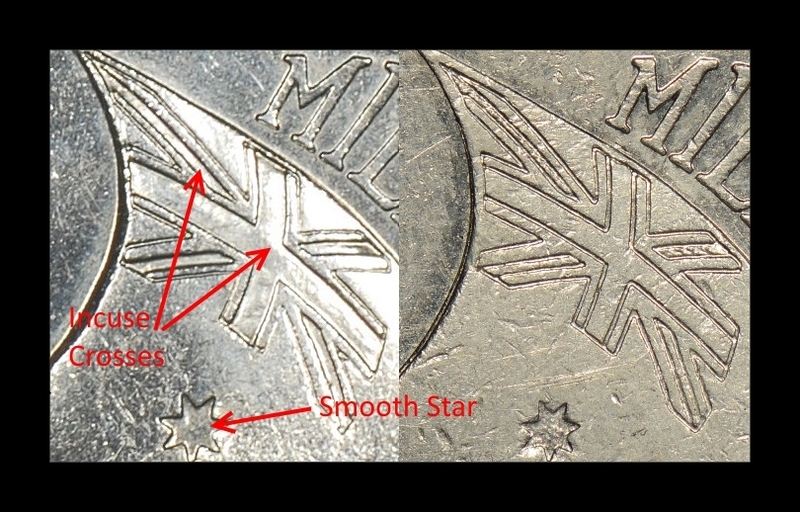 The Federation Star (under the Union Jack) is slightly larger and has a smooth field on the Incuse Millennium. The standard Millennium 50 cent has a rougher field on the Federation Star and the star is slightly smaller. It’s an easy variety to spot, and if you see a Millennium 50 cent in your change it’s worth taking a closer look at it, you could be about to spend a coin worth $20! The incuse variety was originally intended for coins used in Mint Sets and the Royal Australian Mint manufactured just one die with the flag variation. That decision was later overturned and the die used for one production run of coins for circulation -approximately 200,000 coins. From an error collectors point of view it’s worth discussing fraudulent use of this coin in it’s proof state. The proof version of the millennium 50 cent only found in 2000 proof sets feature a coloured Australian Flag. Occasionally these have been removed from sets and exposed to acid or some sort of solvent to remove the colouring from the surface. This will leave a blank open field where the Australian Flag should be and remove the polished surfaces of the proof coin making it look like a circulation issue and not a proof. Attempts can then be made to pass off these coins as error coins with buyers potentially paying hundreds of dollars for these man-made fakes. Beware!